HONG KONG – October 5, 2017 – Angie Hospitality, creator of the world’s first 24-hour interactive guest room assistant, Wi-Fi and room control solution designed exclusively for the hospitality environment, is expanding its global presence by demonstrating the award-winning solution at the 2017 Hong Kong Electronics Fair. The prestigious annual consumer technology event is scheduled to take place October 13 to 16 at the Hong Kong Convention and Exhibition Centre. As a solution manufactured by Automatic Manufacturing Enterprise Limited (AML), Angie will be showcased at AML’s booth No. CH-J08 to demonstrate Angie’s full suite of capabilities and educate attendees of the impact of voice technology on the hotel guest experience, as well as property operations. 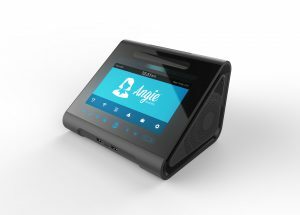 A purpose-built device designed specifically to meet the needs of hotels and their guests, Angie’s presence at this multi-industry tradeshow designates the innovation as one that is gaining broad interest from diverse markets and consumers around the world. Officially introduced as the world’s first cloud-powered, interactive guest room assistant in April of this year, Angie is an enterprise-class solution that is purpose-built to meet the needs of today’s hotel guests. While lauded for its state-of-the-art voice-based technology that allows users to seamlessly control guest room amenities such as lighting or temperature, Angie is further recognized for its ability to serve as a fully comprehensive guest experience enhancement platform. Some of Angie’s key features include acting as a secure in-room Wi-Fi access point, serving as a 24-hour guest room assistant, replacing the telephone, supplying high-fidelity Bluetooth speakers and the ability to offer guest and group promotions through her interactive touch-screen. Angie is currently being implemented at multiple hotel properties in the U.S. and will be available for general distribution later this year. For more information on Angie’s full suite of options and capabilities, please visit www.angie.ai.